Roughly 2 weeks after quitting the alliance we got a post on the alliance forum from Andidna. He stated in his post that his guild members had said that they had enjoyed being in our alliance and would prefer it if they could be back in. So he would be prepared to allow us to invite them back into the alliance on the condition that we removed DC from the alliance. The reasons he gave for them being removed were. 1) DC was a guild created to try and get VoV removed from the alliance. They copied everything down to almost having the same guild colours and emblem, which he found offensive. I'm not sure how imitation would get a guild removed tbh? 2) VoV was a very large guild and the alliance would be stronger for having them within the alliance rather than DC. I of course turned down his conditions for several reasons. 1) DC had done nothing up to that point to break the alliance rules. 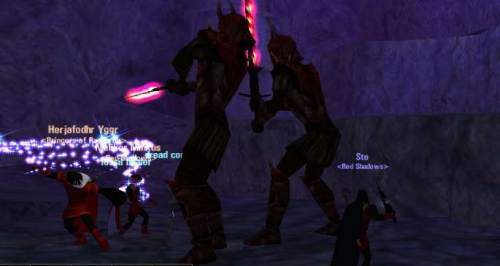 2) They had active players within the guild. 4) I have NO respect for any GM who puts his own personal dislike of one person ahead of the good of his guild and the good of my alliance. If you don't like someone then avoid them by all means but why punish his guild, the alliance, and more importantly your own guild because you don't get on with one person. People like this are at best immature and at worse plain selfish. Definitely not GM material in my opinion. Once someone becomes a GM the game changes for them. In a way their enjoyment of the game becomes a secondary issue as they're now responsible for making decisions for the good of the guild, and every other member within that guild, not just for personal gain or petty revenge. 1) There was very little to no peer pressure, plus the fact I'm one hell of a stubborn c*nt when I think I'm right. 2) Him, and more especially his wife, had spent their short time within the alliance managing to get peoples backs up. Most especially when he realised that one of the /as guilds was run by a very young and very inexperienced GM. He then used the /as channel to slag the GM off and recruit his members from under him. Amazingly nobody thought to report this fact to me until after I had turned down their re-application. This would of instantly earned his guild the boot and my recommendation that they go join VG in an alliance as they seemed to share the same lack of principles. 3) He got very impatient very quickly and stupidly changed tack from attacking DC to attacking me instead, hoping that he could force a vote of no confidence amongst the other GM's within the alliance. So he started slagging me off on the forums. This got everyone's back up and and basically created a unified front against him and his guild ever getting back into the alliance. I think Andidna must of re-read his comments on the alliance forum as he went back and changed every single one to '....'. I believe this was probably an attempt to prevent any of his guild members seeing his true nature. VoV decided to start their own alliance and started recruiting guilds at an alarming rate. It didn't take long for their alliance to match and then over take ours in terms of numbers. I know for a fact that he started pushing forward rumours about the RSA being very immature and the /as channel being spammed constantly with rubbish. It was amusing to see though that the alliance rules for VoV were pretty much the same as RS's. Then as so often happens with fast expansions the VoV alliance collapsed even quicker than it had grown. It seems the catalyst for this was a coup within VoV itself. Pretty much most of VoV's guild broke away to create their own guild after falling out with Andidna. The new guild was called Blood Eagles who, ironically, now currently reside within the RSA. The last I heard of Andidna was a post on his own website saying him and his wife had quit the game due to constantly being backstabbed by unethical people. It's a bit like Hitler complaining about unprovoked attacks really. Well in that case, you obviously do little to maintain a decent atmosphere within your alliance, and have little clout when it comes to serious issues. It is a shame when an alliance exists. that the leader is not in tune with the goings on within his alliance. Reply's posted by Andidna after VoV had they application to rejoin the RSA turned down. He later went back and edited all his reply's to '....' . Unfortunately for him most people had already read and replied to them, usually with quotes from most of his posts, so it didn't do him much good.